Videos, solutions, examples, worksheets, stories and songs to help Grade 5 to Grade 8 students learn how to draw and recognize nets for 3-dimensional shapes. In these lessons, you will learn how to represent three-dimensional figures with nets, by analyzing their faces and bases. A net is a two-dimensional pattern of a three-dimensional figure, that can be folded to form the figure. We will learn how to represent three-dimensional figures using nets made up of rectangles and triangles, and use the nets to find the surface area of these figures. We will learn how to apply these techniques in the context of solving real-world and mathematical problems. 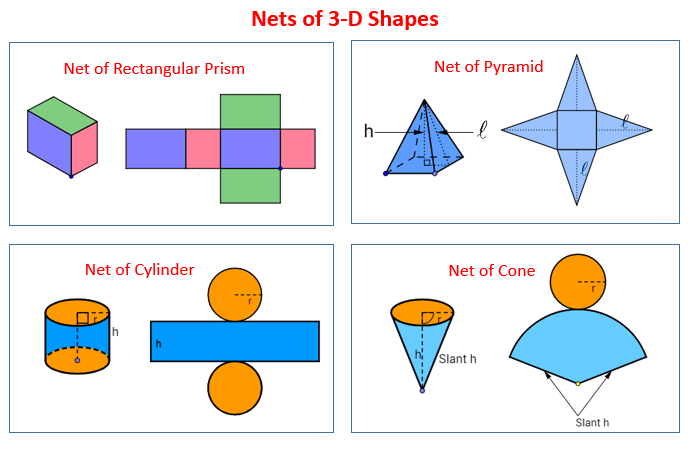 The following diagrams show the nets of some 3d shapes: Prism, Pyramid, Cylinder and Cone. Scroll down the page for more examples and explanations on the net of 3d shapes. A net is the pattern made when the surface of a three-dimensional figure is laid out flat showing each face of the figure. A net is folded to make a three-dimensional figure. Drawing two dimensional nets of three dimensional figures. How to calculate surface area using nets? Using nets and the formula for area to calculate the surface area of three dimensional figures. This video demonstrates the creation of a net for a cube. The folding and unfolding will be shown visually. How to recognize the two-dimensional nets that fold into solids? This video demonstrates the creation of a net for a rectangular pyramid and a triangular prism from the 3-d shapes. A net of a solid is a 2-dimensional figure which can be folded into that solid. This video will show nets of cube, cylinder and cone.